Dr. Seyed Ehtesham Hasnain, joined Jamia Hamdard (Hamdard University) as Vice Chancellor on September 02, 2016. Professor Seyed E. Hasnain (DoB: April 13, 1954), Ph.D. (JNU, Delhi), D.Sc. (h.c.), D.Med.Sc. (h.c), is a Padma Shri and received Germany’s Highest Civilian Award – The Order of Merit (Das Verdienstkreuz, 1.Klasse), from the President of Germany, equivalent of India’s Bharat Ratna, the only Indian so far and one of the very few persons globally. The prestigious American Academy of Microbiology, USA elected him as Fellow. He was recently conferred with the ICMR’s BR Ambedkar Award, the highest award for excellence in Biomedical research. Prof. Hasnain was a Member (2004-2009, 2009-2014) of Science Advisory Council to the Prime Minister (SAC-PM) and was a Member of Scientific Advisory Committee to the Union Cabinet. He was Chairman of Biotech Advisory Council, Government of Andhra Pradesh for several years and a Member of Biotech Advisory Council of many other State Governments, including Gujarat. He received Humboldt Research Prize (Alexander-von-Humboldt Foundation, Germany); the very exclusive Robert Koch Fellowship (the ONLY Indian so far), of the Robert Koch Institute, Berlin; is the first Indian elected as a Member of the German National Academy of Sciences Leopoldina and youngest to be elected as a Fellow of TWAS, Trieste. Prof. Hasnain is also recipient of many prestigious Indian Awards such as G.D. Birla Award, Shanti Swarup Bhatnagar Prize, FICCI Award, J.C. Bose National Fellow Award, Ranbaxy Research Award, Goyal Award, Bhasin Award etc. and is an elected Fellow of all the major Science Academies of India (FNA, FASc, FNASc). He is a recipient of honorary Degrees from Universities in India and abroad and is the 3rd Indian (Dr APJ Abdul Kalam, 2009, Dr Amartya Sen, 2010) to receive an Honorary Doctorate (2011) from the Queen’s University, UK. Prof. Hasnain is a scientist, an institution builder, policy maker, and an administrator. He taught at Delhi University, worked at the National Institute of Immunology, New Delhi and was the first Director of Centre for DNA Fingerprinting and Diagnostics (CDFD), Govt of India and made CDFD a gold standard for DNA based crime investigations in the country. As the Vice Chancellor of the prestigious University of Hyderabad, he made it the #1 University of India displacing JNU and DU for which the Prime Minister of India gave the PURSE Award. 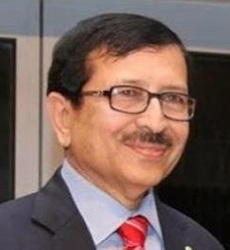 Prof. Hasnain was the Chairman of the Academic Committee of the prestigious Post Graduate Institute of Medical Education and Research (PGI, Chandigarh) and Member of the PGI Institute Body and Governing Council and is a Member of the Research Advisory Committee of All India Institute of Medical Sciences (AIIMS), New Delhi. He is/was Member of the University Grants Commission (UGC); Governing Councils of Indian Institute of Advanced Studies, Shimla; Indian Institute of Science, Bangalore; IIM, Khozikode; IISER-Bhopal and several other institutions; policy-making bodies of the Ministries of S&T, MHRD, Health and Defense. He is a member of the Board of Directors/Audit Committees/Remuneration Committees of a number of Companies. He is well known internationally for his research on Mycobacterium tuberculosis, the TB causing bacterium, and has >250 publications in peer-reviewed journals of high impact, and >dozen patents globally. He has travelled widely in all the continents of the world and has given invited lectures at top Institutions such as Oxford, Cambridge (UK), Harvard, Yale, Stanford, Univ of California, Salk Inst (USA), Institute Pasteur (France), Max Planck Inst, Frei Univ, Koln Univ (Germany), NUS (Singapore), Univ of Canberra (Australia), China, Thailand, Brazil, Senegal, Iran, Saudi Arabia, Bangladesh, Canada, etc. Prof. Hasnain taught at the University of Delhi and after his return to India in 1987 joined the National Institute of Immunology (an Institute of the Ministry of Science and Technology, Govt. of India), and is currently an Invited Professor IIT Delhi where he teaches, has a laboratory and is currently supervising ~dozen PhD students.